Bill Wilson Center's Safety Net Shelter serves youth ages 11-17. Please contact Bill Wilson Center at (408) 243-0222 and ask for an Intake Counselor. Youth may also stop by 3490 The Alameda in Santa Clara at any time for help. 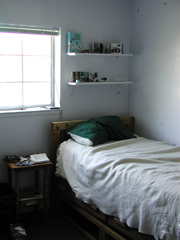 Bill Wilson Center's Safety Net Shelter provides short-term shelter for homeless and runaway youth ages 11-17. Through intensive individual, group and family counseling the shelter's program strives to reunite families whenever possible, prevent future problems and stabilize the lives of young people to keep them safe. A typical day in the shelter includes family-style meals that the youth help prepare each day, assigned chores, school, family and individual counseling sessions, and workshops. For many of the youth in our shelter, it is the first time that they feel safe, that they matter and that they have within them what it takes to succeed in life. The Rainbow Ladder is a system of privileges and responsibilities for residents of Bill Wilson Center's Safety Net Shelter . Each youth begins on the Orange level, giving them time to become oriented with staff, fellow residents and house rules. The steps then go to Green, Crimson, Gold and finally Platinum. Each level has increased roles and responsibilities, but is rewarded with increased privileges. Basic responsibilities for each youth include participating in school, recreational activities and counseling sessions. Establishing positive relationships with staff and other residents is also an expectation, as well as following house rules such as maintaining a clean bedroom and completing daily chores. Rewards for following rules include earned personal time where youth can achieve unsupervised time outside of the shelter. Youth are also rewarded with later bedtimes and a weekly allowance. Each level in the Rainbow Ladder earns increased privileges and more importantly - increased trust. By following rules and showing that they can be responsible, youth earn the trust of residential counselors, which they seem to value most. The majority of the youth naturally progress up the Rainbow Ladder over time. Others find the structure of life in the shelter a bit more challenging and find motivation to comply with the rules and expectations by focusing on the rewards given under each increased level on the Rainbow Ladder. Gold level residents set the standard, they are the example that the newer kids follow. Most residents aim to achieve the Gold level, while others aim even higher and look to achieve Platinum level. Residential staff considers the Gold and Platinum levels as leadership building roles. Youth on these levels assist staff with planning and monitoring activities and also provide a mentoring role to youth who are new to the shelter or having a difficult time in the program. Relationship building is a large part of shelter life. Our residential counselors serve as role models and focus on maintaining safety while building strong positive relationships in order to foster trust. If you are interested in learning more about our Runaway & Homeless Youth Shelter, please consider joining us for an upcoming tour. For more information on Bill Wilson Center tours, please click here.